The 8 Frame Beekeeper Starter Set is for the hobbyist that wants a beehive for pollinating the garden or fruit trees and honey for personal use without the weight of the standard 10 frame hive. It includes 3 Medium 8-frame supers, our IPK screened bottom board with Small Hive Beetle trap, 24 wood frames with wax coated plastic foundation, a frame perch, an entrance reducer, an inner cover with notch for ventilation, telescoping top with aluminum cap. The supers are pine, glued with waterproof wood glue, clamped to square, and screwed with galvanized screws. Handles on each side are under cut for a sure grip. We prime and paint the super with premium mildew resistant exterior latex for longer life. The telescoping top is painted, and then capped with aluminum. The inner cover is wood with tongue and groove construction for added strength. The notch in the middle of the side rail serves both as a vent and upper bee entrance. 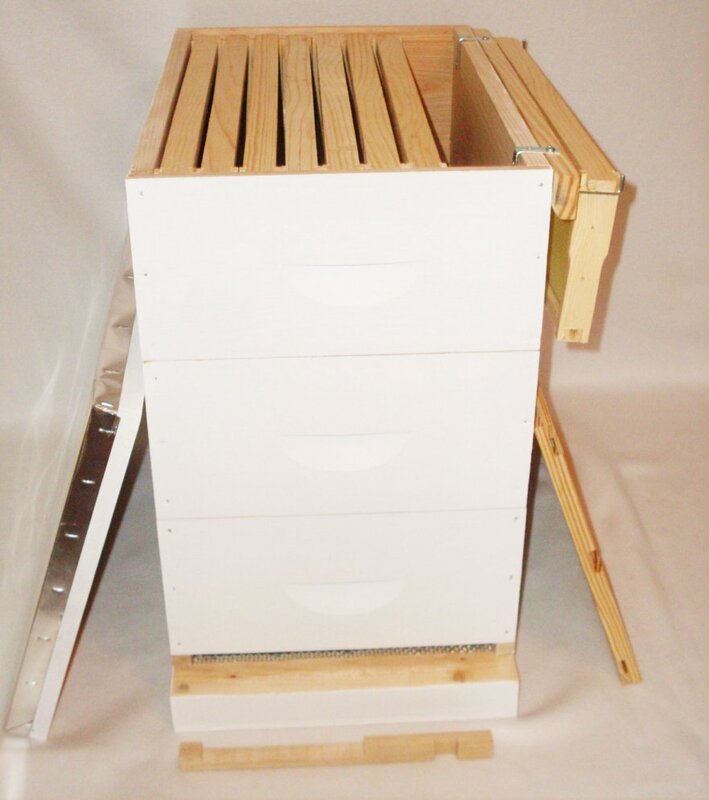 The frame perch shown on the top right side gives you a place to hang the frame you have inspected and keep the bees safe and the frame clean. After you have inspected all of the frames in the super you remove the perch, and replace the top. The entrance reducer in the foreground has a notch on one side for Winter and on the other side for Spring and Fall. You can place it on the inner cover for Summer to increase ventilation. The screened bottom board has a special screen mesh that allows Small Hive Beetles to fall through into the tray of cooking oil, but not the bees. We call it the IPK because it is not an integrated pest manager, but rather an integrated pest killer. It kills Varroa mites, Beetles, ants and roaches. It costs more to ship this set fully assembled due to the added bulk of the order, but it saves you time and money over the DIY kits others sell. We think it's worth the added shipping cost.